My Bargain Basket: Victoria Secret: Pink Nation- First 1 million members get a free gift! 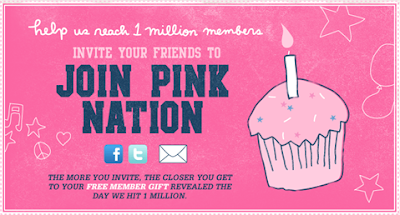 Victoria Secret: Pink Nation- First 1 million members get a free gift! VS Pink is trying to get to 1,000,000 members. They are at about 894,495 right now so they are close. Help them out by inviting friends because once they get to 1,000,000 all members get a free gift!!! Plus they are offering a free deluxe fragrance sampler (no purchase necessary!!!) starting today 2/17 through 3/8 or while supplies last. Log in and then you can print out your coupon, just take it in and get your free sampler! You will also be able to get a coupon for $5 off your next bra purchase! If you haven't signed up before you can also get a free Pink tank and $10 off any $35 purchase! Click HERE to sign up (you don't want to miss the free gift)! UPDATE: FYI - I am not seeing any prompt for a free pink tank on the site. FREE - Arm & Hammer Refillable Shaker! Chili's Appetizer and Entree for $9.99! Healthy Choice Frozen Meals $1/2 coupon! 2 - FREE Tidy Cats - Cat Litter! Kashi: Heart to Heart Coupons $1.50/1! Possible FREE Shutterfly Photo Book! The Limited: 5 Hot In-Store Coupons! FREE 3-Pack of Microfiber Towels! Walgreens New Children's Activity Book! Hurry: Jennie-O $5 Rebate (1st 25,000! FREE Febreze and Swiffer sample kit! Dennys: Unlimited Pancakes and French Fries! New $2/1 Glade Coupon and Reed Diffuser Deal! FREE Sun-Maid Fruit & Sunshine Recipe Booklet! Pampers Dry Max: FREE Samples! Target: Kraft Cheese for $0.50! Ladies Home Journal: One Year FREE Subscription! Free Sample of South Beach living Smores Bars! FREE Sample of Olay Total Effects Body Wash! Burt's Bees: FREE Sample of Toothpaste! Reminder: FREE Aunt Annie's Pretzel Tomorrow! FREE DiGiourno Pizza! - Hurry! Pampers Gifts to Grow: 60 FREE points! FREE - Sample of Crest 3D Whitestrips! Target: 3 - Olay Definity/Regenerist Deal! Starkist Tuna: $0.02 at Target this week! Famous Footwear: 20% off your ENTIRE PURCHASE! FREE Sample of Nestle Abuelita! FREE Full Sized Pantene Nature Fusion Shampoo! Disney Rewards: 50 FREE Points! FREE: Rouge Magazine with P&G Coupons! Nabisco Cookies: You might want to become a fan! bebe: FREE Tote for Facebook fans! Sweet Shoe Sale: 85% - 95% off! FREE - 2 bowls of Single Serve Cherrio's! Pampers - Gifts to Grow - 30 point code! $100 worth of P&G coupons in this Coupon Book! FREE- 20pc Sample of Nicorette Cinnamon Gum! Beano: Get $1/1 Beano Coupon! FREE - Kids N Pets Stain Remover (w/rebate)! FREE Travel Size Dove Hair Care Product!